reading about their exciting work at the forefront of Molecular and Cellular Biology. An academic department’s success depends on the quality of faculty it attracts and retains. BCMB is excelling at attracting and recruiting the very best young scientists in the Molecular and Cellular Biosciences who are performing research at the cutting edge of their discipline. In this issue of our newsletter, we feature assistant professor Josh Bembenek, an outstanding cell biologist who joined the faculty in 2012. He was the recipient this year of a prestigious five-year R01 grant award from the National Institutes of Health to support his groundbreaking research in cell division and development. As we look ahead, the department’s future is brightened by the recent groundbreaking of the Kenneth and Blaire Mossman Building that will house the BCMB faculty labs, core labs, classrooms and office space that presently reside in the Walters Life Sciences Building. While many of us remember Walters fondly as the home of BCMB, we are excited about the Mossman building which is a modern state-of- the-art facility. It will feature two floors of dedicated teaching classrooms and laboratories—designed for flexibility to accommodate the needs of different disciplines and to promote and accommodate the newest teaching pedagogies, such as hands-on active learning, interactive “peer-to-peer” group discussions, and the use of technology as instructional tools. Faculty research labs in the building will be constructed in an open laboratory format to promote increased interaction and collaboration between the various research groups within the department. 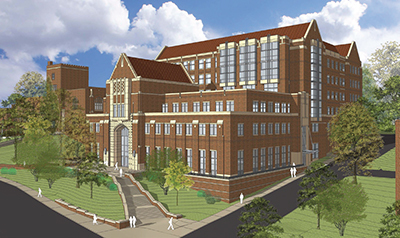 The building will feature a modern vivarium as well as a dedicated computational laboratory to support the research and teaching of four internationally renowned computational biologists/biophysicists in the faculty. This science teaching and research facility represents a step change in infrastructure, a strategic priority in UT’s journey towards the top 25.